Begonias are flowering plants used as houseplants and in the garden. Landscapers select begonia varieties for their attractive foliage or flowers. Many begonia varieties do not tolerate severe winters. Cold region gardeners dig up frost-intolerant begonias prior to winter, use them as houseplants and replant outside in the spring. Some varieties do well in the sunlight while others require partial shade. 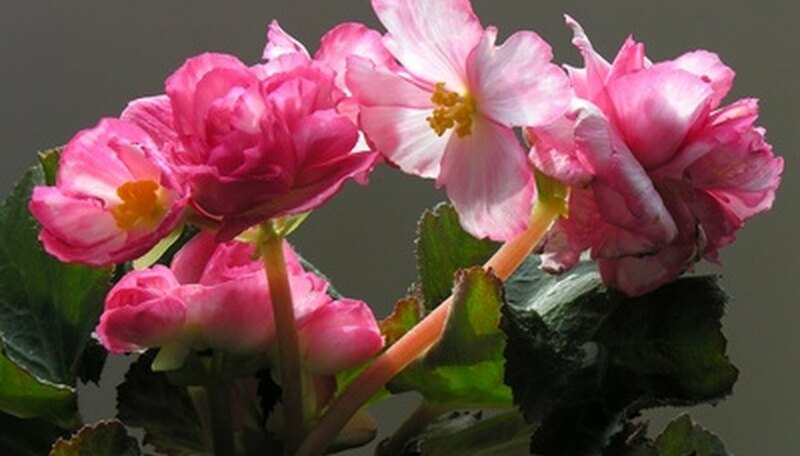 Flowering time varies by begonia variety. Avoid wet and soggy soil if growing the begonia in the garden or as a potted plant indoors. Locate a water source that is not soft water treated. If your home has soft water, draw water from a faucet that is not connected to the soft water system, such as an outside faucet. Schedule the watering for the early morning. Press your finger in the soil to test for moisture. The soil should be evenly moist and allowed to dry out slightly before re-watering. If watering a potted begonia, place the pot in the sink to catch the water. Irrigate the soil beneath the begonia with a low stream of water. If irrigating a potted begonia, water until it begins draining from the pot. If watering begonias in the garden, allow the soil to get thoroughly soaked without getting soggy or muddy. Empty the dish under the potted begonia after each watering. If you keep your potted begonia on a dish, water will collect in the dish after watering. Never allow the potted begonia to set in a dish of water. Don't water tubular begonias in the winter.